I have to say I love the smells of our house right now. In the oven drying out are our cinnamon applesauce ornaments. Our hands smell of cinnamon and so does the house. I will post pictures tomorrow. 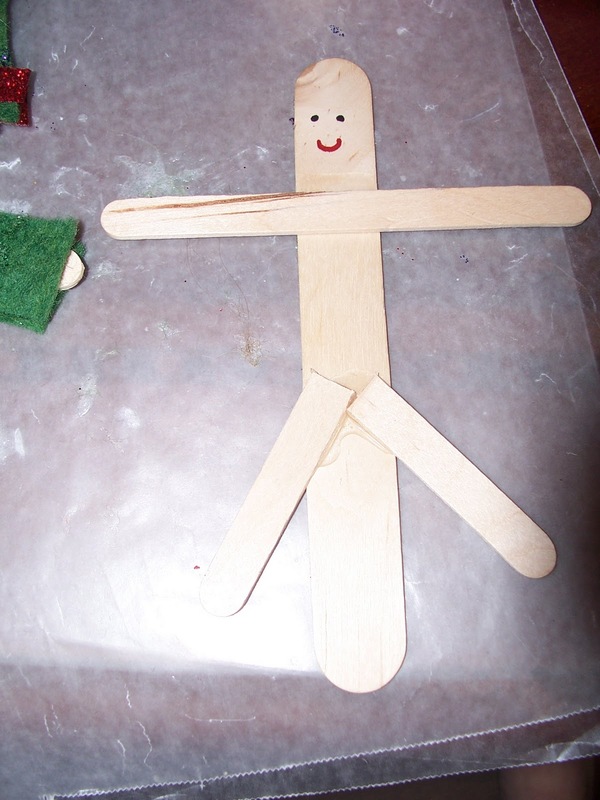 Yesterday and today Hazel and I made some popsicle stick puppets. 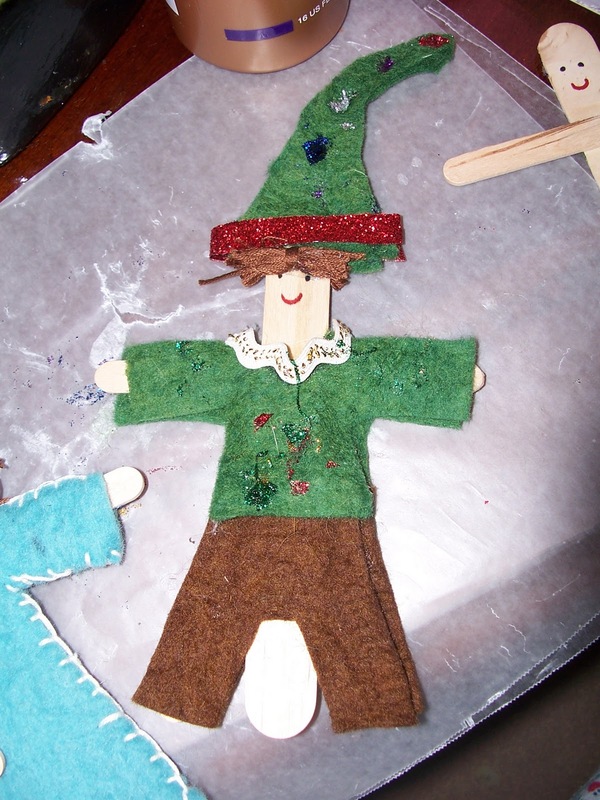 We started by making an elf for a gift for one of Hazel's friends. Then she wanted one for herself and we made a few others. While she was sleeping I dressed one as a princess, which we named Hazel and sewed the sides to make it look a bit fancier. Hazel has been loving decorating them. I gave her glitter glue and ribbons and trims to decorate with. These are easy for kids with a bit of help. To start we glued a popsicle stick as arms to a tongue depressor. 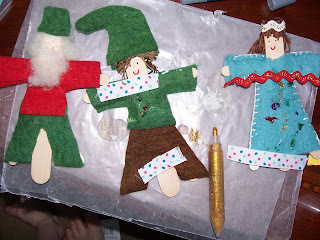 Then cut a popscile stick in half for the legs and glued them on. I used markers to draw on eyes and a mouth. Then I cut clothes out of felt--a front and back for everything and glued it on. I used embroidery floss for hair or wool roving or stuffing. 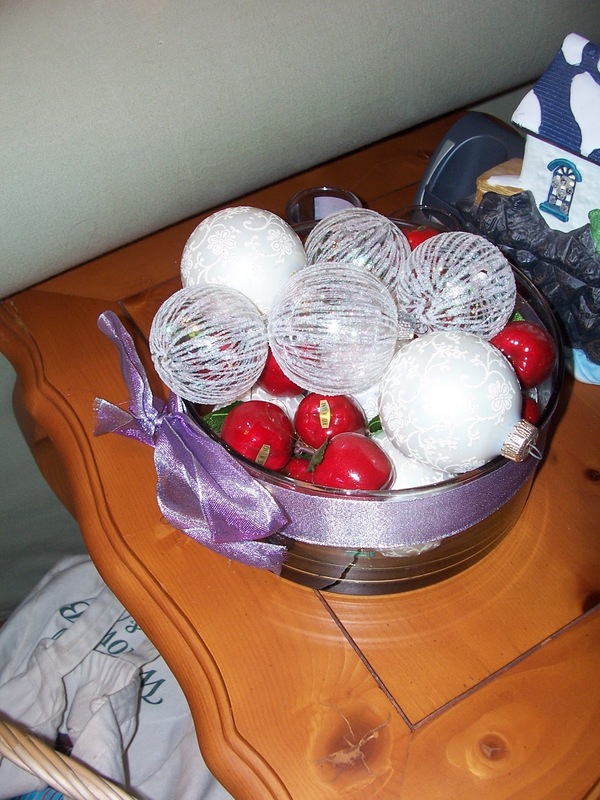 Then Hazel went to town decorating. She was loving cutting the ribbon and trims as well as the glitter. 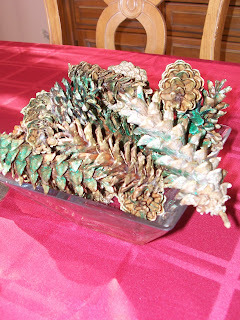 I love that they are something fairly easy to make that she can decorate and play with and they can be different things for the various holidays or just a regular day. Tomorrow is December 1st. 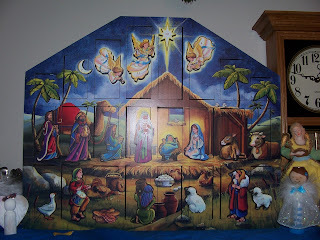 I wanted to share a quick picture of our Advent calendar. We are very fortunate to have received it as a gift from my parents one year. This year I'm filling it with mostly needle felted figures for a nativity so we can talk about the story with Hazel and she will have the figures represented in toys she can touch and play with. Isn't it beautiful? It is such a wonderful tradition to have. Just thought I would share a few other "decorations" we have around. Very cute puppets, and I really like your advent calendar! Stopping by from Toys in the Dryer! So cute! Pinned your puppets to my Puppets & Such pinboard. Nice weather here = time outside! !